Art Deco is an eclectic artistic and design style that began in Paris in the 1920s and then became popular in the 1930s. The style is famous for its influence on architecture, interior design, fashion and jewelry etc. The Empire State Building, the Chrysler Building and Rockefeller Center in New York City are good examples of Art Deco style in architecture. That being said, Art Deco has equal influence on typography. Art Deco fonts are fonts with streamlined and geometric beauty. Art Deco style is characterized by straight lines and sharp angles, which is completely different from its predecessor, Art Nouveau. Many Art Deco fonts are available only in capital letters and they are good for display designs. Due to its decorative nature, it is good for projects like poster, advertisements, book covers etc. RM Deco designed by Ray Meadows is a typical font family of Art Deco style. 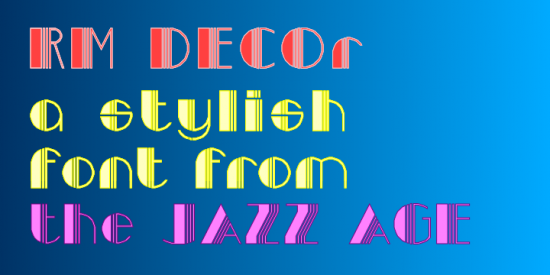 The font mixes the bold and fine lines so that it will evoke the spirit of the 1930s Jazz Age. To download free art deco fonts, you can take a look at our free fonts collection, which offers more than 20,000 fonts in different categories. If you are looking for art deco fonts that are of high quality (well kerned, broad character support, etc. ), have a look at art deco fonts at myfonts.com. If you don’t want the hassle of downloading and installing fonts, but just need simple designs in art deco fonts. Check the tool below. Below is a collection of art deco fonts. You can use the following tool to generate text images based on your selection of colors, sizes using art deco fonts in seconds. To download the image, just right-click on the image and save. To embed images on web pages or forums, you can click on the "EMBED" button to get codes.